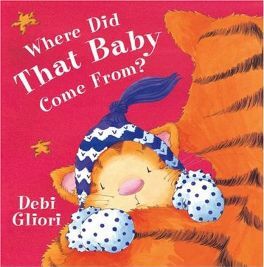 My daughters and I have read quite a few of Debi Gliori’s books together and I always like the way that each one is a bit different. We have just read ‘Where did that baby come from?’ and really enjoyed it as it is both funny and thought provoking. In fact on all of the first few pages it becomes quite apparent that the small cat is not at all enamoured with the baby and wishes that it wasn’t there. It seems to be a totally useless object and he really can’t see the point of it being there. However, there is a turning point about halfway through the story when after wishing that the baby would disappear into Outer Space, he notices that it is crying in its cot and the older siblings protective instincts come into play. From this point on he views the baby differently and there is a much more tender note to his musings as he wonders why the baby is either crying or laughing. When we first read ‘Where Did that Baby Come From?’ I was a bit concerned about the character’s negative attitude towards the baby but it is his change of heart that makes the story so interesting. It also makes me think that, because of this fact, it would be a good book to share with a small child who is about to have a baby sister or brother himself. It would help to demonstrate how much time the baby will take up and how it might be difficult to share Mummy and Daddy, but it will also show how wonderful it is to have a baby in the family and how much joy it is likely to bring. The whole story is also written in rhyme which is always good for helping to develop children’s early phonological awareness especially as they can join in by predicting the rhyme. There is also quite a bit of repetition in the structure of the verses which should mean that children can soon start joining in with the telling of the story which they will love. My youngest daughter is also just starting as a reader so she is just beginning to be able to read some of the words. This repetition really helps her to read some of the words. There are some brilliant illustrations that accompany the story as well. They are bright and vibrant and have a great deal of humour within them and they are well worth taking time over to absorb all the detail. They really do help to bring the story alive! No Comments on "Where Did That Baby Come From?"